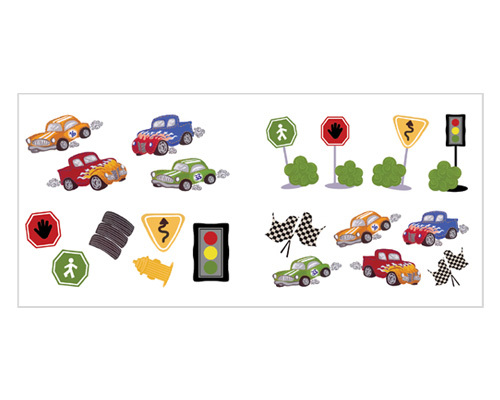 Inspire hours of imaginative racing play with these Fast & Fun wall decals. Your child will love the whimsical atmosphere created by these colorful race car characters and you will love how easy it is to tranform a room in minutes with these repositionable Fast & Fun wall stickers. Our Fast & Fun wall decals (also known as wall appliques or wall stickers) make transforming your child's bedroom, playroom, or even classroom a breeze. A decorator's (and mom's) dream, these Fast & Fun wall stickers are repositionable, removable, re-usable, and washable with no damage or residue to the wall surface when removed. Approx. 3.5" x 3.5" to 7" x 3.5"
This fun Checkered Race Flags fabric wall art is a wonderful addition to any racing themed room.